From 4th April 2017 to 4th May 2017 is the third month Jia Chen (Yang Wood Dragon) of the Ding You year (Yin Fire Rooster year) with the ruling energy of #6 in the central grid. Kun 2 Black (Ju Men) is an earth star and a yin Trigram and visits the north in April and needs either cures or avoidance this month in this area. Try and keep this area of your building as quiet as possible and avoid building work or renovations this month when possible. If this part of your building is a bathroom, utility room, guest bedroom or other less important room do not panic, this is great news for you and no cures are needed this month. Place a brass Wu-Lou or a set of six Chinese coins tied with red ribbon beside your bed. The brass Wu-Lou (also known as a calabash) gives elemental support to this area this month and also symbolises good health and dissipates the negative energy of the #2 star and it can also be left here for the whole year as it complements the #6 star as well. You can use any metal ornament as long as it is not sharp or aggressive looking, and believe it or not a good cure is a round metal dog bowl or even weight lifters weights. A brass dragon is also a lovely cure to use in the north this year. Avoid candles or bright lights in the north at all costs in April. Check or upgrade smoke alarms and other fire prevention methods. Li 9 purple has entered the northeast and is considered a star of future wealth and has an auspicious influence in Period 8. Career opportunities and promotions are probable especially if you have an office or main door in this area this month. This is a good area in general especially for those in studies. If this is a family area (living, dining or a library), encourage children to study here. Couples with a bedroom in this location can also enjoy good relationships. There may also be a chance of producing intelligent children. If you want to enhance this further place a red statue of Kwan Yin in this part of your bedroom. Sun 4 green enters the east this month and on the whole it is considered an auspicious star. The Sun wood 4 is a conditional star and is auspicious in Period 8 (2004 – 2024). It governs romance, career, travel, creative, academic and artistic talents, wisdom and intelligence as well as self-development. With the wood of the #4 star flying in for the month, we can expect a lovely energy from here as it creates a lovely peach blossom if activated correctly with the right enhancers although please remember that the Three Killings is located in the east in 2017 so this area should be kept calm and quiet. Couples with a bedroom in this location can also enjoy good relationships if the room is kept peaceful. There may also be a chance of producing intelligent children. If you want to enhance this further place a statue of Kwan Yin in this area of your bedroom. Avoid fire element and colours red, pink or purple in April. Good colours are blue, grey or black. If you wish to enhance areas of creativity and academic achievements, place or hang moving objects to enhance the Ch’i of this sector, do not use wind chimes. Keep area semi active with windows occasionally open. The 5 Yellow is located in the southeast this month and it affects the overall luck so please be careful with the southeast this month and care is needed as we have earth being fed by the annual #9 fire star. Overall a very inauspicious star and needs either cures or avoidance this month in this area otherwise it can cause problems. If your bedroom, office, lounge, main door or other important room is located in this area and you are unable to move out please read this section carefully. You MUST NEVER disturb this area inside or out with lots of drilling or knocking activities in April. So please be careful if you have work to do and if you have a main door here you should also place a flat Ba Gua wealth protection mirror. Summary: Do not activate this area with loud noises this month, keep this area quiet and avoid at all costs building work or refurbishment. Do not use the fire element or colours red, pink or purple. Keep doors closed. Place a Wu Lou and six coins here along with metal ornaments. Use colours white, silver, gold or copper. I will repeat this part, as it is so important, please keep this area of your home or office as quiet as possible this month, avoid redecoration and building work in this part of your home or office. Kan 1 White Kan (Tang Lang) is a water element and a yang Trigram and in April, it has flown in to the south. This area can also be very good for relationships this month and to enhance you should introduce some metal elements that are round in shape, a traditional enhancer and cure is a brass wu lou or any object that is round in shape and made from a good quality metal like brass copper, steel which will also help weaken the negative influence from the annual #5 star. If you disturb this area this month you may cause problems for the middle son and it could affect ears, kidneys or blood related. If you have any poison arrows like lamp post, pylons or large comers of house’s pointing toward this area consider hanging a flat ba gua mirror outside pointing towards the offending object. Generally though there is nothing to worry about with the #1 star as it is it is timely and an auspicious star but the south should still be kept quiet due to the annual 5. Chen 3 Jade is a wood star and a yang Trigram and in April, it has flown in to the southwest and affects the feet, lungs, convulsions, liver, bladder, limbs and hysteria. It also affects the eldest son and overall very inauspicious and needs cures or avoidance this month in this area otherwise it can cause problems. Do not hang wind chimes of any material in this area this month, especially metal wind chimes as it will worsen matters. Remember this is only a passing influence for the month and if you follow all this advice here your month will be just fine. Ken 8 White enters the west in April and is considered the most auspicious flying star. When activated correctly it brings good fortune and exciting times even with the conflict of elements. If you work with symbols, quartz crystals, crystal balls or hanging faceted crystals are very good for the this area this month. The #8 star also governs relationships so a nice romance enhancer is a pair of Mandarin Ducks. Please remember that we have Tai Sui located in the west for 2017 and you should not activate the malevolent effects with loud noise or ground-breaking unless advised by a professional. Hang a faceted crystal sphere in this area. Hang it above head height and twist now and again. A red three-legged toad can be placed here. Make sure the toad is facing into the house and not towards the door and the coin is never taken out of his mouth. If your bedroom is here, you can also place an amethyst or any crystal items in the area of the bedroom to further strengthen the earth element of the benevolent 8. You should also add some fire colours into the west in April and it is good to burn a candle as long as it safe to do so especially with children and pets around. Tui 7 Red robbery star has flown in to the northwest in April 2017 alongside the annual #2 star. The trigram Tui is also known as ’Broken Soldier’. This is a fighting star which can cause problems if left alone, the #7 Red indicates a high risk of burglary, deception, copyright theft, gossip and back stabbing this month. Ch’ien 6 visits the centre in April and is a compassionate money star and a yang Trigram and it affects the lungs, large intestines and head and can impact the Patriarch (eldest male) although on the whole it is considered an auspicious star. 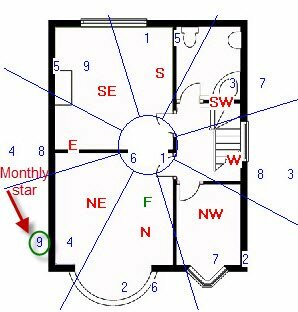 Whilst 6 White represents accomplishment, if the #6 monthly star is located in a bedroom it can cause problems with the throat, and/or legs and also problems with breathing especially for the eldest male although they are minor problem and nothing to worry about if you follow the advice here. If you do have a bedroom in this area place some blue, black, grey or charcoal cloth such as a rug or duvet covers to dissipate its energy. If this is your bedroom, a shade of blue or black in your furnishing or décor may help with health. A blue painting (not water scene) may also do. Real quartz crystal is very good in this area for the month as are faceted crystal spheres. This is a lovely influence for the month and if you follow all this advice here your month will be just fine. Please remember to make the most of the positive areas this month and for the negative areas this month, remember that this is a passing influence and as long as you have the annual cures and enhancers in place, the effects will not be as bad.